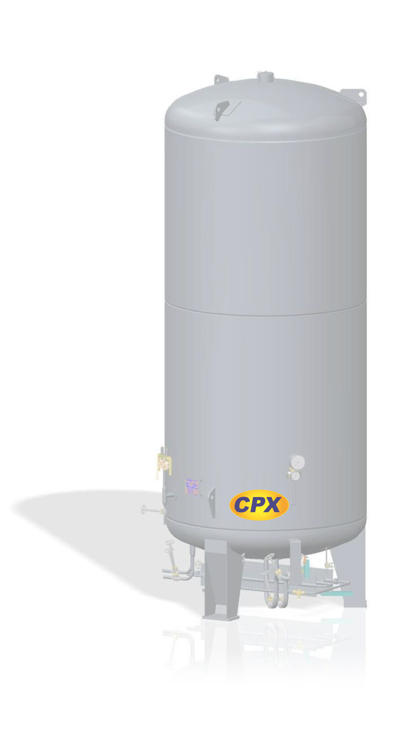 LOX Tanks are stationary, vacuum-insulated pressure vessels for storage of cryogenic liquefied gases. Low evaporation rate, ergonomic layout of instruments and controls for ease of use, carefully selected components and outstanding build quality ensure a high degree of reliability and economy in everyday use and guarantee the longevity of the vessel. Vessels are available in vertical or horizontal configurations, sized from 2,200 to 200,000 litres, and are manufactured and tested according to the European Pressure Equipment Directive 97/23 CE (PED) or to the regulations of other countries. Our vessels have been in use world-wide for decades. High quality is ensured by measures, including a quality management system complying to ISO 9001. 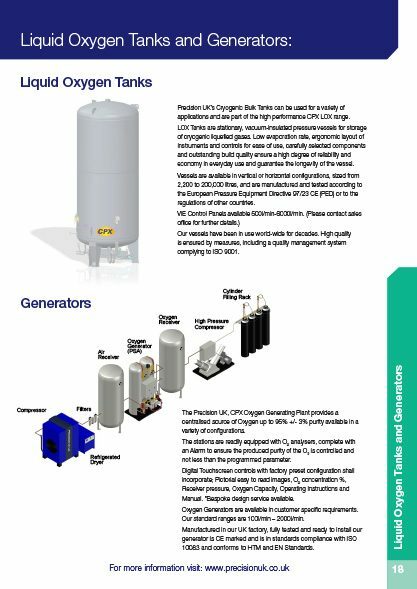 The Precision UK, CPX Oxygen Generating Plant provides a centralised source of Oxygen up to 95% +/- 3% purity available in a variety of configurations. The stations are readily equipped with O2 analysers, complete with an Alarm to ensure the produced purity of the O2 is controlled and not less than the programmed parameter. Digital Touchscreen controls with factory preset configuration shall incorporate; Pictorial easy to read images, O2 concentration %, Receiver pressure, Oxygen Capacity, Operating Instructions and Manual. *Bespoke design service available. 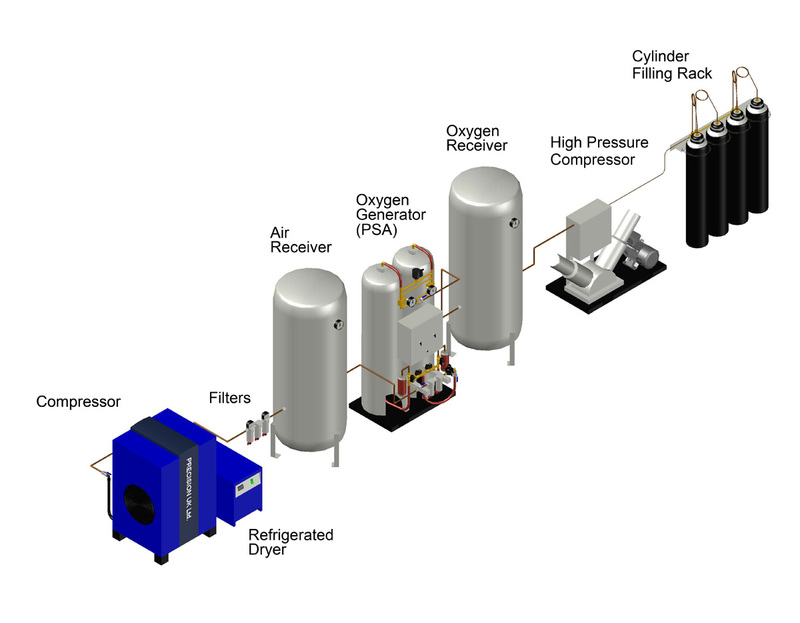 Oxygen Generators are available in customer specific requirements. Our standard ranges are 100l/min – 2000l/min. Manufactured in our UK factory, fully tested and ready to install our generator is CE marked and is in standards compliance with ISO 10083 and conforms to HTM and EN Standards.